Over the winter months, if you have a low-laying or low-sloped roof, massive snow build up may occur. While this may not immediately lead to leaking or ice damming, the weight of the snow puts a huge strain on your roof sheathing, trusses, and, in turn, your entire home. 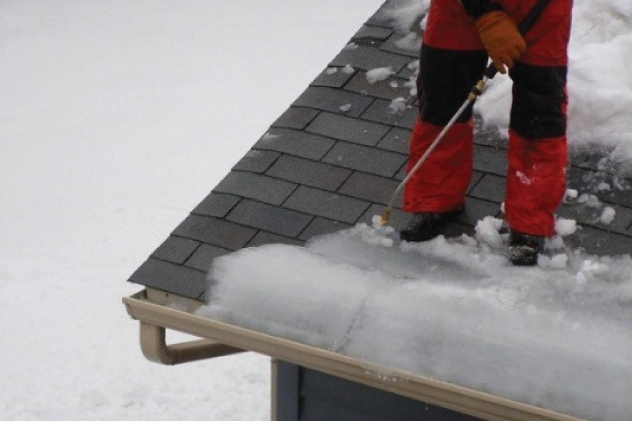 If you don’t regularly clear your roof in the winter it can lead to a bowed roof and sagging eaves. Help protect your investment and call Bart’s Rooftops to have your roof shovelled by our professionally trained staff. Ice Dams – How they work. A few inches of snow on your roof is generally not an issue- However, when your roof is subject to temperature differences between the area over your attic and the eaves, it may be vulnerable to ice dams, leading to water leaks. As snow melts from the top of your roof, it runs down towards the eaves. If the temperature at the eaves is below freezing, that water runoff can freeze and form a ridge, or ice dam, blocking any melting snow from draining off your roof. Once there is a pool of water stuck behind the ice dam, it has nowhere to go but underneath the shingles, likely finding a fastener hole, which can lead to mold, damage of ceilings, walls, insulation, and other areas inside your home. You can help prevent ice dams by having adequate attic insulation partnered with proper roof ventilation. Contact Bart’s Rooftops for a professional assessment.